If you appreciate the work I've done on my car, and if you've seen the work I've done on my wife's 1966 Mustang (Link to her website is in the Navigation Bar) and you like the style of the custom parts, then take a look at my company website. The type of work I do is very different from everything else you see on cars at cruises and shows. 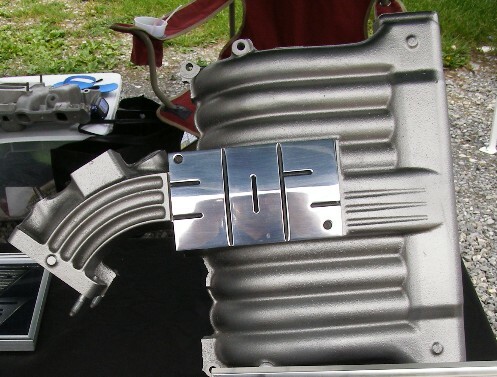 We currently have custom billet aluminum, CNC machined ignition coil covers for Ford 4.6L 32 valve engines from 1999-2004. You've never seen anything like these. Here's pictures of a couple of the 4 styles available. These parts are machined from 6061 T6 billet aluminum and are polished to a mirror finish. Another product we are waiting to start production on is for all the people with a 1994 - 95 Mustang or other Ford with the 5.0L engine. Tired of the boring intake manifold plates? Our's is an original design, CNC machined from the same 6061 T6 billet aluminum in a 3 dimensional style that is raised in the center and again polished to a mirror finish. Have something in mind for yourself? Are you a member of a club and are interested in parts with your club logo on them? We will draw YOUR custom design, or we will create one for you, in CAD at NO CHARGE to you! This way you can see what the design or the part with the design will look like before you commit to a purchase. We want you to be perfectly comfortable with the design and we will make any changes you desire so that you get exactly what you want. This way we are all on the same page. Visit my Website at www.artisticmachine.com . It's certainly not the same old straight grooves or flames like you see on so many cars. It's custom parts like you wish you could make yourself.